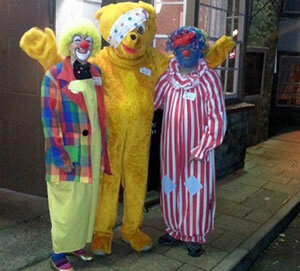 Brue Valley Rotary Club would like to thank all the diners and people out for a quiet drink in Wincanton, Castle Cary and Bruton on Friday 16th November, who had their evening interrupted by clowns, Little Bo Peep and Pudsey bear. In addition to visiting most of the pubs in the area, Pudsey made a surprise appearance at a children's party at Castle Cary Rugby Club, and these characters were welcomed wherever they went. Thank you for helping us raise over £800. To find out more about Brue Valley Rotary Club, check out our web site at www.bruevalleyrotary.org.